I absolutely love popping into Gemini as not only do I enjoy taking a peak at all their lovely clothes & accessories, everyone is also so incredibly helpful & friendly & you can always find someone on hand to talk you through their latest collections & help you with suggestions. Luckily for me I didn't have the task of picking what to wear as Donna had put together some gorgeous outfits for me to try. But before I show you the pictures I should point out that I have something to add to the well known phrase of 'never working with children or animals'...yup I have now discovered during said photo shoot that you should never work with newly cut fringes as they have the habit of parting quicker than the Red Sea!!! Yup that's right two days before having my picture taken I decided to go for a bit of a Claudia Wrinkleman haircut.....well it's cheaper than botox right?!!! But unbeknown to me due to years of being parted said fringe didn't want to stay put....luckily after my dis-as-ter I've now been let into a top hairdressing secret of how to stop said parting of the ways, so my hair is now back in the good books! So let's get back to the photos. First up is this gorgeous little number which Donna styled around this lovely Great Plains striped jacket. Of course it's not going to come as any surprise to you to know that I love this jacket - navy, breton striped & made from a 100% cotton so nice & easy to wear & a great stylish alternative to knitwear when the weather is warmer but not hot enough to go without a layer or two. It looks really fab teamed with the mint green jumper, which isn't something that I would have thought to put with the outfit as I would have thought it would be too washed out on me but the navy really helps balance the look. Plus the Kennel & Schmenger navy boots are super gorgeous too & a lovely alternative to the brown & black knee high boots that I have in my wardrobe at home. For outfit two Donna indulged my inner Bet & styled me in these stunning InWear animal print trousers...if these don't have my name all over them I don't know what does & the jumper is just the perfect slouchy styled jumper for teaming with patterned trousers as well as pairing with skinny jeans & tan accessories. Now I've never worn loafer, I've loved them from afar but have never taken the plunge as I've worried that they would seem to heavy compared to my beloved ballet pumps but this pair from Hobbs may have changed my mind - stylish, comfy & I love them teamed with trousers, not to heavy at all & I'm loving the pointed fronts. More neutral tones in outfit four where I'm wearing some super comfy & stylish leather fronted leggings & this amazing boucle knit jacket....I have SUCH a weakness for boucle & this French Connection clutch is gorgeous too, such a great size for fitting everything in. Finally I absolutely love the colours in this next dress, which is also from the new Sandwich collection. I have a real weakness for corals/pinks & pinky/reds & they have to be one of my favourite shades to wear especially come the warmer months. In fact Sandwich have a whole new collection coming out in these colour tones, which I'm super excited about & I love this colour teamed with the grey just stunning! Now I also tried on several more gorgeous outfits but I'm going to leave those for another time but in the meantime if you fancy learning a bit more about me then click here to read my interview with Gemini. Of course it would have been rude not to make a couple of purchases while I was there, the first of which is this gorgeous breton top, a real classic wardrobe staple that's going to look stunning dressed down with some distressed boyfriend jeans & ballet pumps not to mention cream jeans & tan accessories finished off with a navy blazer. As for my other purchase I'll leave you in suspense & share it with you when I post the remaining photos from my photo shoot. Which much to Joe's relief I remembered that I needed to look down but have now developed the habit of blinking.....Joe I promise I'll work on this for the next time!!! So what do you think? Do you have a favourite outfit or accessory? Maybe you're tempted to make a sneaky purchase or two? As always I'd love to hear your thoughts. Have a fab Sunday, after a rather muddy dog walk I'm off to eat, drink & be merry plus perhaps catch the odd forty winks or two!!! See you in the week. Thanks Joanna, thought you might like the leopard print trews! Loving all the stripes Jane and our navy bag will match so well with them for S/S!! I also love that dress with the tan boots on you:) Enjoy the rest of your afternoon! Thanks Anne & yes the navy bag will look stunning with my new top, it's such a great new addition to my wardrobe! Thanks Paul, I have to admit those leather leggings & boucle jacket are both stunning...I can feel a wardrobe hole appearing as I type!!! The pink dress is such a gorgeous shade of pink Sharron & great for just throwing on. As for the fringe I did ask my hairdressers to cut it to just below my nose....think that would just about hide all wrinkles for now but we decided I'm too accident prone to even risk it!!! Very envious of your fab dressing up opportunity Jane....would love to be a model for the day! My favourite outfit is no. 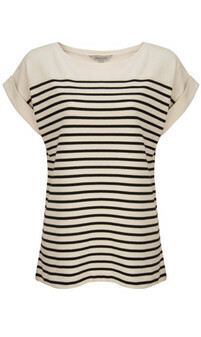 4 and I love the Great Plains stripey T!! Thanks Lynne - yes I could definitely see myself wearing outfit four too - leather & boucle is always a winner in my book! Thanks Sian...thankfully the fringe is behaving now!!! The jacket is gorgeous isn't it & I for one believe you can never have enough jackets in your wardrobe...the fact that I now need another wardrobe to house all my jackets is another thing entirely!! your own outfits are much more youthful and funkier than the styled ones, as a novice, it is really interesting to see what a difference clothes make! I LOVE the leather leggings, I can't believe they are the real thing and at such a great price, annoyingly I have just bought a pair from Joseph which do not fit like that and were three times the price. I'd like to see how you would put together stuff from Gemini Woman as they seem to have some great pieces at sensible prices. The leather leggings are gorgeous Alexandra, what a pity you've just spent more on the Joseph ones & aren't pleased with them. Gemini have some really lovely pieces in stock so it's worth spending some time looking at their website as they really do cover everything from accessories to clothes to shoes! Ahh thanks Annmarie outfit four definitely appears to be everyone's favourite - such timeless pieces too! Really like that first outfit! I'm all about accessories. Especially scarves! Thanks Alex, you can't beat accessories for bring an outfit to life. Oh what fun - I need to get friendly with a cool store!! Cute stuff I love the pink dress and the striped blazer! Outfit no 4 for me but I have to say, I do like the pinky/red Sandwich dress - something a little different and very fresh for the coming months ahead. Now what tips can you pass on about posing in front of the camera - you look very at ease. I can't do it - I burst out into nervous laughter every time. And fringes - I can barely remember a time when I didn't have one! The colours of the dress are gorgeous aren't they Sue, I can definitely feel myself being drawn to these colours especially now the sun is putting in an appearance. As for posing in front of the camera, I'm going to have to give full credit to the team at Gemini, seriously I'm a nervous wreck!! Thanks Andrea, I am indeed very lucky, would never have thought in a million years I'd be doing something like this when I started my blog!